They say heart never grows old and age should not be a barrier between you and the things that you love. 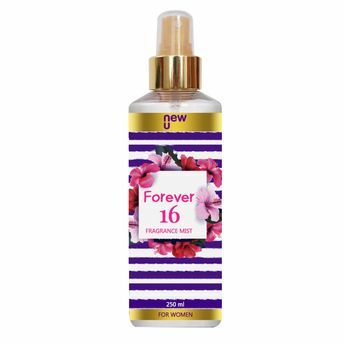 We salute the same spirit with our fragrance Forever 16 which is dedicated to people who are always young at heart and do not want to get lost in the boredom of this world and monotonous life. if you like to play it smart, this body mist is for you. Go out feeling the way you like and don't let the rules define who you are! Stay Forever 16! Additional Information : Stay You, Stay Beautiful with NewU products! NewU is a Dabur Enterprise, bringing to you a wide range of color cosmetics, personal care, and grooming products all at affordable prices. Explore the entire range of Body Mist/Spray available on Nykaa. Shop more NewU products here.You can browse through the complete world of NewU Body Mist/Spray .